YWCA Hunter Region will be conducting school holiday vacation care for children aged 5 to 12 years. 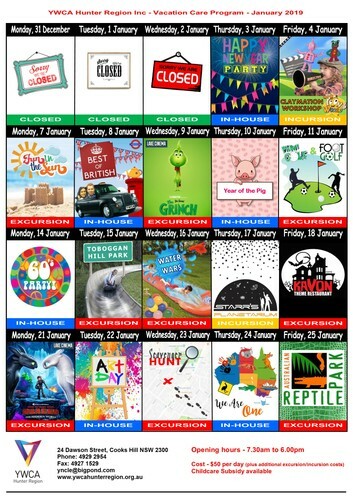 The program for the January school holidays includes excursions to the movies, beach and reptile park, as well as lots of fun, dancing, activities, games, craft and cooking at the centre. For enrolment and booking information, visit YWCA Hunter Region website or phone 4929 2954.